If British MPs reject the deal once again, there will be no deal. 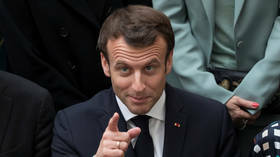 Macron’s message sounded somewhat contradictory, however, as he also said that he is “open to a technical extension” of the Brexit deadline, but he stressed that the ball is in London’s court. “We must be clear, to ourselves, our British friends and our people. Firstly, we’ve been negotiating the withdrawal agreement for two years. It cannot be renegotiated. Secondly, in the event of another ‘No’ vote in Britain, we will be heading towards a no deal. Everyone knows it,” Macron said as he arrived at a summit of European leaders in Brussels. The British parliament is expected to vote on the EU-backed offer for the third time next week. Despite two previous defeats in the legislature, Prime Minister Theresa May is still urging parliamentarians to finally support the accord.